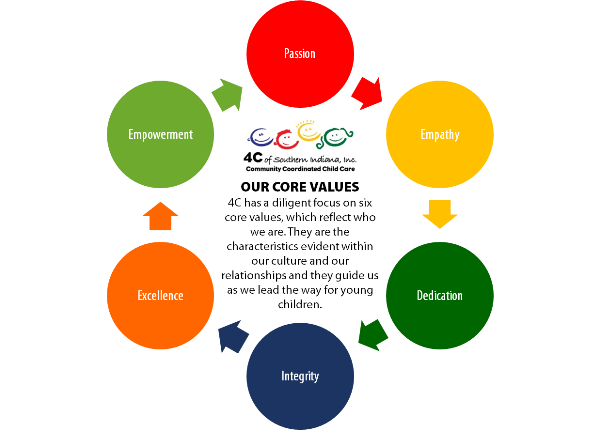 4C is a nonprofit serving 14 counties in Southwestern Indiana. 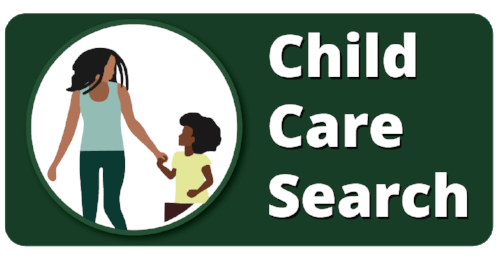 More than forty years ago, 4C started out as a true grassroots organization with a few local child care directors and preschool teachers meeting to network and share information about child care. 4C was incorporated in 1969. In the late 1990s, research about brain development in children identified issues around child care as national priorities. 4C hired its first paid employees and the organization began to grow. In 2003, the State of Indiana selected 4C as the regional Child Care Resource and Referral agency for Southwest Indiana. Support from the Welborn Baptist Foundation raised 4C's profile and the level of services provided by 4C to a whole new level in 2004. With support from Welborn, 4C piloted Paths to QUALITY (now Indiana's official child care quality rating and improvement system) and implemented family coaching based on the Parents as Teachers model. 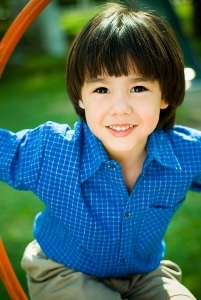 In 2011, 4C assumed the role of Child Care Development Fund (child care subsidy) Intake Agent for Southwest Indiana. Building on efforts to reach new populations, 4C designed and introduced 4C Play & Learn, programming for family, friend, and neighbor caregivers in 2012. Along with other community partners, 4C also worked to convene and inform a business roundtable on early education in 2013. Communities across Southwestern Indiana value the success of all children as one of their highest priorities and equip every child at an early age with the resources needed to be successful. To increase the accessibility of high-quality child care, the supply of high-quality care must be increased and parents must be connected with high-quality providers. To increase the quality of child care, parents and early care and education professionals must be provided access to appropriate materials and training. To increase dialogue and form advocates across the spectrum, research that supports long-lasting, positive impacts of high-quality early care and education must be shared with all stakeholders. When children receive high-quality early care and education, they are better prepared to succeed in school. When children succeed in school, they are better prepared to succeed in life and become healthy, contributing citizens. Sustainably increasing the affordability, accessibility, and quality of high-quality child care and early education requires commitment at the grassroots and leadership levels.